Which is not to suggest that we have any shortage of very serious, heartrending concerns that we must discuss and confront. That includes nature-related issues like climate change, species extinctions, pollinator declines, and habitat loss, and it most certainly also includes the human-related tragedies that took our breaths away this past week. Still, nature is funny. And surely those crises only make it more poignant and important for us to revel in the beauty, wonder, and diversity of the natural world. At the very least doing so provides a respite from the world's turmoil; at best, it reminds us of our better angels and the great good that fills this world. 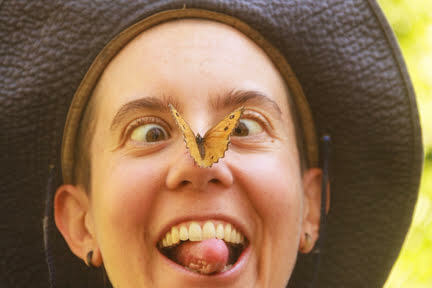 Really, is there any better response to the threats facing the natural world than to laugh and clown around as Katya Spiecker did when a Great Arctic butterfly seemed to mistake her for its host plant? And how else should we respond when a bear sticks out its tongue at us? Or looks like it might be peeing on its cub? Should we pretend it's not humorous at all that a squirrel can grab a cone, spread its "wings," and soar through the air like it just don't care? What about when we look around our towns and trails right now and see the vibrant reds, purples, yellows, and other colors of native wildflowers: Should we not smile at the grand design of this little world of ours? And when one of those flowers looks like a cow’s head, and another like a long stick with elephant heads shooting out in all directions—what then? Aren't we somehow duty-bound to admire and laugh at nature's wondrous oddities? The fact that there exists a big, slow, tree-climbing rodent with 30,000 quills—is that not funny in and of itself? What about when this so-called poky rabbit appears to flirt with us, yellow teeth be damned? And when a Red-winged Blackbird's very survival appears to depend on the way the wind blows, surely a little mirth is in order? Should I go on? Because I could. Along with funny photos (please post your own)—we all have funny nature stories. The mouse that jumped on Mom and made her squeal. The horror and regret on the face of a kid who swallowed a chokecherry. The sight of an eagle swooping down to steal the trout right off the line (heard that one just the other day). When I’m out hiking, I see people laughing and pointing and having a grand ol’ time. Scientific research shows that being in nature is healthy; it helps us relax; it makes us feel good. Those studies seem to be chipping away at the edge of the real story: that we crave wild nature so profoundly because it is our beginning and our end, the very essence of who and what we are as animals on this earth. Now, I know, seeing the humor in nature won’t erase climate change or end racism, or save our thousands of endangered species. But it can remind us how much we love the living world—and why it’s worth preserving that world for the young ones of this generation and those to come.